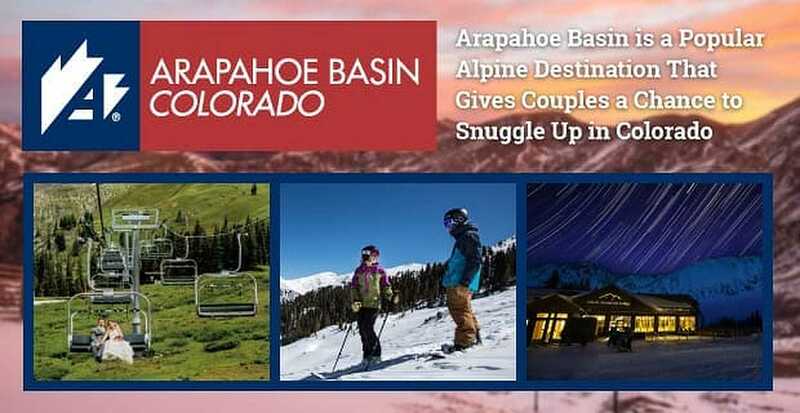 The Short Version: Couples looking for a relaxed mountain vacation can head to Arapahoe Basin in Colorado. During the day, hit the slopes or take snowboarding lessons to connect with a partner in a romantic setting. 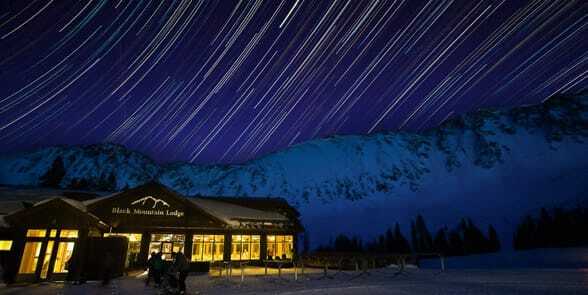 At night, enjoy a culinary experience under the stars at one of A-Basin’s special evening dinners. If you’re really feeling the love, you can plan a unique destination wedding in Arapahoe Basin and say your vows in the heart of the mountains. Arapahoe Basin’s laid-back atmosphere creates the perfect Colorado mountain experience for couples looking for rustic romance. Located 68 miles west of Denver, Arapahoe Basin has 1,331 skiable acres and 132 trails to explore with more terrain coming in 2018 and 2019. A-Basin, as the locals call it, boasts a summit elevation of 13,050 feet. While it has runs for the novice and intermediate skier, much of Arapahoe Basin appeals to seasoned skiers who want to challenge themselves on black-diamond and double-black diamond slopes. Over the decades, the wintry destination has attracted thousands of skiers, snowboarders, and, surprisingly, bridal parties. The beautiful Alpine backdrop makes for an intimate Colorado wedding and honeymoon. You can grab your favorite snow bunny and hit the slopes together while the powder is fresh in the morning. Crisp air and sunshine await you at Arapahoe Basin. If you’re new to snow sports, consider taking lessons during your visit. You can learn a new skill alongside your partner and create memories of your day in the snow. The small-group lessons at Arapahoe are led by seasoned skiers and snowboarders who give personal attention to each participant. Experienced skiers can enjoy the two new expanded terrain areas: the Beavers and the Steep Gullies. The Beavers is best for intermediate skiers, while the Steep Gullies are rated double-black diamond and best for extremely skilled skiers. Even if you can’t negotiate the more difficult stretches of terrain yet, you can admire the skill of skiers coming down the mountain as you sip a hot cocoa or specialty cocktail at several on-mountain eateries. Arapahoe offers terrific après-skiing options, including grab-and-go lunches and sit-down meals. The Perch offers great mountain views from its patio, which can accommodate about 100 guests at a time. At the A-Frame Lodge, the Legends Café serves classic ski fare, including salads, burgers, and made-to-order hoagies. Food lovers can find a little bit of everything at Arapahoe Basin. You can stop by the Pacific Rim Asian Station for rice and noodle bowls or meander over to the A-Basin Taco Truck for street tacos and burritos made fresh every day. 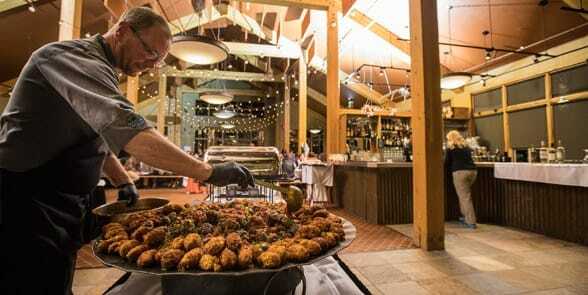 Arapahoe Basin’s annual Moonlight Dinner Series offers couples a romantic evening savoring good food in a mountain setting. This special event is held at the Black Mountain Lodge on wintry Saturdays when the moon is full. Guests relish an incomparable dining event surrounded by the natural beauty of the area. The dinner begins with a pre-dinner happy hour at 6th Alley Bar & Grill. Then it’s time to board the Black Mountain Express lift and make a romantic ascent toward Black Mountain Lodge — where you’ll enjoy a memorable dinner featuring spices and ingredients from around the world. The night includes live music entertainment and beautiful moonlit views of the mountainside. At the end of the evening, you can take the lift or hike back down the mountain together. Each dinner in the series has a theme, so you can enjoy a luau or a romantic Italian night in Colorado. Be sure to reserve your table months in advance because seats fill up quickly. According to Meredith, these dinners have been known to sell out in 16 hours. Whether you want to be pampered at a resort or settle in a private space all your own, there are various accommodations nearby to meet everyone’s preferences. From condo to chalet, you can choose your ideal getaway and snuggle up by a fireplace or turn up the heat in a hot tub. No matter where you stay in Arapahoe Basin, you’re sure to see some amazing sights. Wherever you stay, you can relax with your partner and take time to appreciate nature in a secluded spot in the mountains. If you have a bottle of bubbly or a locally sourced craft beer to share, all the better. Many wonderful, budget-friendly lodging options allow couples to live in the lap of luxury in Summit County while spending their day at Arapahoe Basin. Whether you’re looking for a hotel within walking distance of restaurants and shopping areas or a remote getaway tucked in the mountains, you can enjoy a fun outdoor experience at the hotels, lodges, and rentals available here. 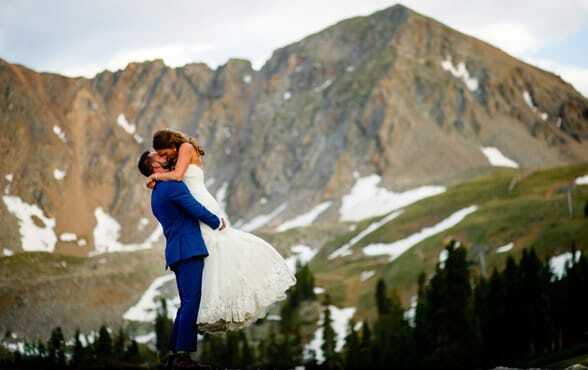 In addition to romantic getaways, Arapahoe Basin’s majestic scenery has been the backdrop for many weddings over the years. “The venue gives couples the opportunity to share a beautiful setting with friends and family members who may never otherwise get to experience anything like it,” Meredith said. A majority of weddings at the resort take place in the summer months, and Meredith said the ideal place for saying your “I dos” is mid-mountain at the Black Mountain Lodge. Bridal parties and guests take the chair lift to get to the venue, so they come away with some fantastic pictures of the mountains. Inside the lodge, vaulted ceilings supported by massive timbers give the wedding a rustic yet elegant feel. Meanwhile the expansive dining area’s high windows offer unmatched views of the Continental Divide. The actual ceremony typically takes place on the spacious outdoor deck with picturesque views of the mountainside. “You really get this rustic, romantic experience,” Meredith said. “Since we have one venue, you get personalized attention.” Meredith and her team can help you with anything you need to plan your big day. They have a tried-and-true list of wedding affiliates who know the area and can help you create the destination wedding of your dreams. If you want to bond with your partner in the powder, by the fire, or on a honeymoon, Arapahoe Basin is the perfect place to get away from it all.